Old Picture of Nixon, Hall, Baart children. We spent a long time in Bulawayo looking for diesel. 7 or 8 garages had none – finally a small independent had some and a small queue saw us filling up. We then spent a long time getting a sim card. Something that requires your passport, your address, itinerary and full health details (not really the latter but not far from it). Probably should have done them concurrently but you live and learn. Big problem with diesel here. Basically no foreign exchange so no –one can buy it in. Total, Mobil, etc – all the big name garages but no diesel to be had. We have long range fuel tanks – but even so, if we can’t get any diesel we won’t be able to get to Mana Pools. Actually -we’d get there but not back which may be a plan. Absolutely beautiful camp. Well run, comfortable without all the fussiness of the more upmarket “chain” camps. Made even better by the knowledge that we spent holidays in that camp as young children. Not much game to speak of – we are too close to Botswana and despite recent atrocities of elephant poaching in Botswana the game is voting with their feet and remaining in Botswana. Long lush grass here – but no grazers, loads of Mopane in pristine condition but no elephants. Poaching here is, I think, still rife. Not helped by the fact rangers and other parks board employees are paid very sporadically if at all which makes poaching not only a more lucrative option but a survival mechanism. Zimbabwe has 60 rhino; 8 were poached from Matopos last week, 10 were sold/given to the Democratic republic of the Congo. So down to 42. This was one of the most heavily populated Rhino areas in the world. Grace [Mugabe] continues to help fund her lifestyle by poisoning waterholes and de-tusking the elephant. Talk is that an aerial survey has shown dozens upon dozens of carcasses but the government will not release the information. Something that amazes me is the conversations we have had and the conversations we have overheard. The same conversations that have been had for over 50 years. How much longer can we carry one for? When will the government see sense? Have you SEEN the exchange rate? Zimbabwe has a national debt of 2 billion. Mugabe and Mngagwas personal fortunes could repay it instantly. 90% of GDP here goes on government salaries. That doesn’t even include the multitudinous bribes that get passed to officials. US $ 186 million has been borrowed from China to rebuild Harare’s airport – apparently in no need of rebuilding. The contract is for 183 million. The extra 3 million goes into official’s pockets. The Mugabe’s apparently still have the snouts deep in the trough. Grace continues to mine diamonds by the bucket load, receives govt funding to fly back to Zimbabwe on a chartered flight to visit her ailing mother etc . Its enough to make you weep. What really does make you weep though is to see people our ages who had parents and parents parents build up successful farms employing 4000 in some cases – with clinics and schools onsite who lost their land in the land redistribution. These people and their employees have walked off their land with nothing but the clothes on their back and have had to reinvent themselves in order to make ends meet. Not only the white land owners but the black employees too. There are countless of these people that have started again from nothing at our ages and have rebuilt lives despite the odds. They report that their huge tobacco and coffee plantations have now returned to bush with no cultivation at all bar subsistence crops. I absolutely take my hat off to these incredibly strong and resourceful people who whilst tired of the status quo, keep on keeping on. It is not a problem of black against white here and a tussle for dominance but rather a continual battle of the people against the government and a culture of absolute corruption. All made more poignant by the fact that but for the toss of a coin, this would have been my life. My Mother and Father came to Rhodesia (as it was then) and threw their heart and soul into a country they loved. There was no apartheid here though it was a white minority government. My Father was one of two partners in a quantity surveying firm. When UDI (Unilateral Declaration of Independence) was declared that severed the ties with Mother Britain, work dried up and the practice could only support one partner. Neither John Coom nor my parents wanted to go. It was decided on the toss of a coin and my father lost. Update on diesel situation. As we arrived in Vic Falls so did the Total Diesel bowser. A queue and a bit of diesel rage saw us filling the tank and all our jerry cans. Today the diesel is Pelile (gone). Bit of luck for us. Victoria Falls never fails to inspire and fill me with awe. Truly should be on everyone’s bucket list.The hotel is as gracious and well-maintained as it ever was. 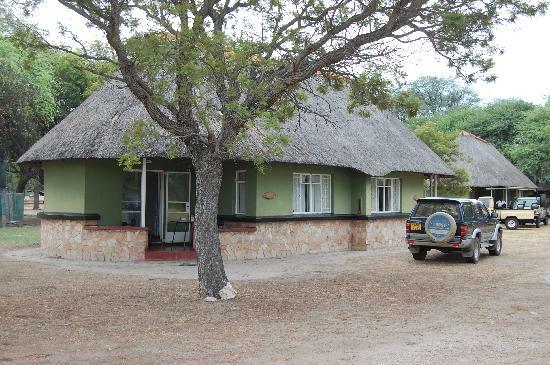 We were not able to get but are staying i n a lodge in the Zambesi park nearby. Very luxurious and we are really lapping it up as we begin the very much rougher and tougher part of the trip tomorrow as we set off for Mana Pools. Everyone we meet comments that its “really wild” up there. Some of you may have seen the elephant footage of a man practically in the elephants mouth from a few days ago. Elephant just curious but….. Tomorrow we head for Kariba. One night on the car ferry where there are a limited number of mattresses on the deck, Advice is to book one as soon as you can!